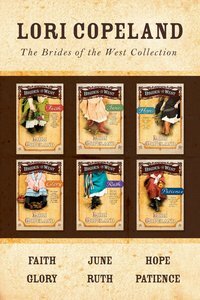 This collection bundles the entire 6 volumes of Lori Copeland's popular Brides of the West series together in one e-book, for a great value! Lori Copeland continues her historical romance series, Brides of the West, with book 2, June. Mail-order bride June Kallahan arrives in Seattle from Michigan to discover that her intended, Eli Messenger, the assistant to a famous evangelist named Isaac Inman, is ill. After he dies, June stays on to work at the local orphanage, where she realizes Inman is allowing the orphans to go without in order to build a showy tabernacle. A romance blooms between June and Parker Sentell, a friend of Eli's, as they try to convince Inman of the errors of his thinking. Readers will learn the important lesson that God is ever faithful, even when we don't understand his plan or purpose in our lives. June delivers a lighthearted, entertaining story along with strong moral values and a Christian worldview. About "Collection (6 Volumes) (Brides Of The West Series)"
Customer Reviews For "Collection (6 Volumes) (Brides Of The West Series)"
I've had about a week's worth of late nights cos I couldn't put my e-reader down till I finished one of the six books in this series. It's true, Lori's books are uplifting and inspiring. Best-selling? ?author Lori Copeland? ?kicks off? ?this historical Western series with this pleasing tale of mail-order brides set in 1872. When their pastor father dies suddenly, leaving little money, three sisters realize that they need to take drastic action to survive. Each answers a newspaper ad soliciting Christian brides. Faith goes to Texas, where her intended, a well-to-do rancher named Nicholas Shepherd, seems to be having second thoughts. While her wedding is repeatedly postponed, Faith meets a local widower and decides to teach his blind son Braille. In time, Nicholas begins to realize that he may have lost Faith to another man. A sheltered mountain girl, Glory is forced to build a life on her own after her Poppy dies. With a bagful of gold and no change of clothes, she sets out in search of a new life. Far too naive for the cold world before her, she ends up on the run from a greedy uncle who wants her gold?? ?and who will kill her to get it. She manages to latch on to a wagonneer named Jackson and a group of teenage mail order brides. In her travels and adventures, Glory grows into a beautiful young woman with an unshakable faith?? ?but will her faith be enough to win the heart of the handsome wagonneer?